AMS Shows Its Spirit – What’s Up With the Wildcats? Student Council has kicked off spirit days with their annual spirit week. There is a different theme every day and you are supposed to dress according to that theme. Mondays spirit day was Disney/vacation day. 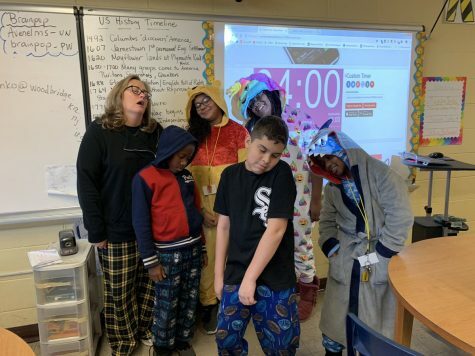 Tuesdays was pajama day and Wednesday was Halloween day because it was Halloween. (Last week we had a Halloween dance but you could go check out a different article on that.) Thursday was school spirit day so students made sure to wear black and yellow. Friday is red, white, and blue day because we have veterans coming to the school and we want to honor them. Your homeroom representative will pick a student everyday from the homeroom that shows the most spirit. They will also have their annual obstacle course. Your homeroom representative will give you roles such as scooters and football toss. The obstacle course will be Thursday during your specials block. If you are not in gym that day, you will be called down from whatever class you are in. Seventh grade will be called down first block, eighth grade second block, and sixth grade fourth block. The homeroom with the fastest time will go against the teachers on Friday. Let’s go students! Let’s go teachers! Have a great spirit week AMS!